When your life becomes completely affected by awful people at work then it is time to check in with people who really care about your safety at your job, our hostile work environment attorneys at Rager Law Firm in Pasadena. If you have never seen the movie Horrible Bosses then you need to at least see the trailer to understand what the term hostile environment really means. Now, because this is a movie, the situations were more exaggerated, the premise is still good examples of what not to do at work. For example, Jennifer Aniston’s character, a dentist and her technician, actor Charlie Day, most known from Sunny in Philadelphia, were working on a client when Aniston’s character throws water onto Day’s pants. She makes crude comments on what she can see due to the pants sticking to his thighs. Throughout most of their scenes she makes sexually explicit comments. She even drugs Day and takes crude pictures with him to use as blackmail if he doesn’t agree to sleep with her. Other bosses in the film committed hostile work environment behaviors by wanting to fire “fat” people or the one disabled person in the office. These are exaggerated, but not far from the truth. Unfortunately, not all bosses are good people. Not all bosses got to their position through honest behavior or hard work. Hostile work environments are more than just tasteless jokes or rude behavior. Hostile work environments are created when someone commits repeated behaviors that are disruptive, hurtful, or illegal. These behaviors must be documented and handled through the company’s HR. 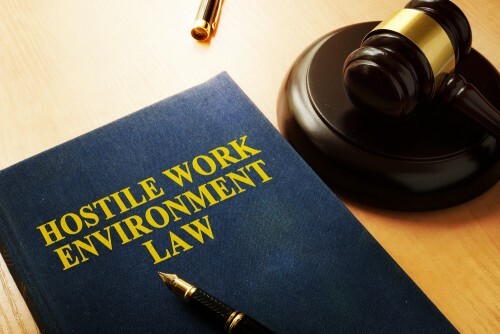 If you or someone you love is having a hard time work due to unsavory people at work then you may have a situation of a hostile work environment. Clearly, our Pasadena hostile work environment attorneys at Rager Law Firm does not advocate hiring a hit man to get rid of your boss. That is illegal, unethical, and immoral. Instead, we encourage you to reach out to the Rager Law Firm to get a better understanding of what is happening in your workplace. For example, if you are experiencing repeated discrimination, sexual harassment, or other severe behaviors then you may be experiencing anxiety, depression, or prevent you from completing your work. When you tell your HR that you have been experiencing difficulties at work a report and investigation must be conducted. If there is no investigation then that may tell you all you need to know about your workplace. When your life becomes completely affected by awful people at work then it is time to check in with people who really care about your safety at your job, our Hostile Work Environment Attorneys at Rager Law Firm in Pasadena. Call 310-527-6994 or click here to start a free consultation with our legal counsel today. We have worked with a plethora of clients who have experienced the same awful working conditions as you. You are not alone and we will do all we can to guide you through this process. You have the right to work in a safe space and you have the right to call out your employer for not employing the efforts necessary to resolve the situation.